Fighting disinformation is a hot topic among media, regulators and the general public. Governments turn to banning of media outlets, journalists or Internet-based platforms. Still, users find ways to circumvent bans and blockages turning to proxies, perceiving bans as disrespect for their intelligence and as a violation of human rights. Media literacy measures, on the other hand, open the floor to discussions, popularization of professional standards of journalism and critical thinking. Informally, media literacy activities can take place in libraries, community centres, at public events and presentations. Activists, vloggers and bloggers or game developers should not be disregarded. Their posts and products are, sometimes, more popular than any traditional media products and channels. In this lecture, Corina Cepoi will share how we can ensure we know where the facts are coming from, and how we can spread media literacy. Corina Cepoi brings over 20 years of experience as a media, civil society, and communications expert. 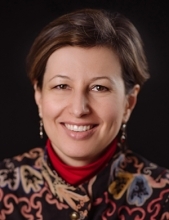 Founder of the Chisinau School of Advanced Journalism at the Independent Journalism Center (IJC) in Moldova she has consulted and trained for organizations such as the World Bank, USAID, UNDP, NDI, Transparency International, EU, and UNESCO.